If the career of a truck driver has even been portrayed as glamorous or simplistic, the fact of the matter is, it’s certainly not. However, that doesn’t mean trucking can’t be rewarding, stimulating, lucrative and an overall success for people – in many cases, it’s all of those things. As one of the fastest growing careers on the job market, commercial trucking has proven to be one of the forefront burgeoning industries in the country. For every businesses that sees development, there is surely a truck driver who gains another client and route. Industry status notwithstanding, many wonder what living the trucking lifestyle is truly like. Those interested in driving often expect long hours on the road, meeting all different sorts of clients and people and clambering into a highway-side road stop for a cup of joe and a slice of pie. Those in the industry themselves can attest to some truth in this – long hours, hauls to folks of all sorts, and possibly the occasional slice of pie. There are many types of runs that drivers can choose from – local and regional lanes, dedicated runs and over-the-road hauls. Local and regional lanes generally put drivers in a position where they are delivering to customers in an area close to their terminal. Many of these lanes are daily runs that gets drivers home nightly or every few days. For dedicated runs, drivers generally know exactly what distance and for how long they will get to their destinations and consequently back to their terminal. These runs may see drivers our for longer periods of time than a local run, but some drivers may prefer this due to the consistency they see on the runs. Over-the-road hauls are situations wherein drivers often see a great deal of time out on the road for a designated period. When working over-the-road, a driver’s time off in between runs is few and far between, but the payoff is usually a large amount of miles, and money for those miles. Choosing a run truly depends on how a driver wants to structure their lives and what works best for their style of work. For drivers, a great deal of the direction of their lifestyle comes from their family situation. As with any occupation, those with family and loved ones nearby may come across issues that stem from being gone for extended periods of time. Though many drivers do see frequent and consistent home time, some routes simply require drivers to be out on the road for many days to weeks on end. This lifestyle has the possibility to put a strain on those with partners and/or children. Of course, the family unit works both ways – many single drivers may find that a lack of support back home or a family to work towards seeing is just as difficult to deal with. Many drivers would attest to the fact that having some support network back home makes for an easier time on the road than not having one at all. Another factor drivers must consider is the physical and mental fortitude it takes to become a carrier. Many driving companies make sure to list required psychical qualifications for potential applicants, including the ability to lift and carry certain weights. In addition to this, drivers must think about being able to sit for hours on end and sleep comfortably in their cab for over the road runs. Driving certainly isn’t just a physical test of being able to unload freight, it’s a marathon often involving several different factors and situations one must perform well in. Drivers must also be mentally prepared in order to perform well on the road. The ability to focus and concentrate on driving safely and efficiently with a variety of tractor-trailer combinations is only one part of the driving experience. A driver must be able to calmly and collectively deal with any distractions or frustration that may occur on the road. Driving may also be monotonous and may take a mental toll on a driver – it’s important for a potential trucker to know how long they can confidently perform one task for an extended period of time. One other factor drivers must remember – you’re not just a transporter, you are an extension of the company you are carrying for and therefore a customer service rep. Drivers who are too brusque or lack communication skills with clients are not generally favored by their employers. There is usually some expected level of customer interaction that exceeds simply unloading the freight – it’s how companies build client relationships. Overall, there’s a nomadic sense to driving that may appeal to some individuals. Getting to experience the country in some level of solitude while getting paid – that’s a dream come for many. There is an enormous amount of drivers who are truly at peace while on the job, with a clear and concise mission in mind as well as the ability to operate without being micromanaged like one might feel in an office setting. Many companies are willing to pay well for your time too – it depends on your area and willingness to run consistently. Luckily, many carriers understand life on the road and have updated their equipment for ease of the driver as well as providing an environment for drivers that may make life on the road somewhat entertaining. With some trailers outfitted with GPS, mini refrigerators, satellite radio and sometimes even Wi-Fi, drivers aren’t stuck to running through static on their CB or keeping to themselves. The practice of driving may stay the same, but the aspects that go into trucking certainly have advanced. Ultimately, potential drivers need to ask themselves the following: am I the type of individual that can see themselves out for extended periods of time doing the same job for a wide variety of people that depend upon me? If one really thinks about it, truck driving isn’t all that different from any other occupations in the above sense. For drivers interested in learning more about becoming a driver, or the opportunities available to them, Express Truck Driving Jobs has you covered. Offering student programs, amazing benefits and an incredible support system to drivers, those interested in pursuing a driving career need look no further than Express Truck Driving Jobs. If you think this is the career path for you, call us today at 866-878-2508. As with any owner operator job, there are certain mental and physical components that are not always apparent when you are just starting out. When it comes to living the real trucking lifestyle many owner operators understand that each haul can be taxing on their bodies. When you're in school learning all of the ins and outs of driving a big rig truck it is very exciting. Indeed, you are anxious to finish up that training so that you can take your truck out on the road. Once you actually start driving you'll quickly find out that its not all about enjoying the freedom of constant travel. Think that you can wolf down fatty foods like burgers, fries and donuts day in and day out without any health consequences? Think again. You may enjoy eating lots of comfort food along with tasty snacks, but a lot of these meals will cause you to gain weight real fast. Combine a poor diet with the typical sedentary nature of driving for hours on end and your physical health can spiral out of control. 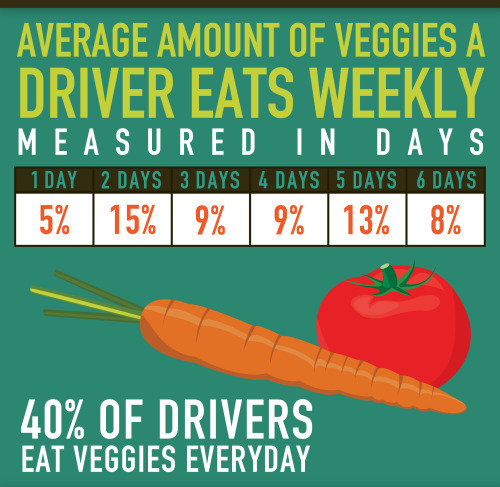 Owner operators are constantly under the gun and often don't bother with trying to eat healthier foods. Check out this blog on how to choose a healthy menu. Many Americans relate being a tough driver to harsh conditions, a stressful life, and the habits of a bachelor. Truck drivers often spend weeks away from home, delivering cargo in state after state. For some, this nomadic lifestyle seems alluring. Truck drivers get to see the country and meet all kinds of people on a regular basis. For others, trucking is simply a good way to pay the bills. With all the stereotyping surrounding the experience of driving trucks for a living or the kind of person who chooses such a unique lifestyle, it's hard to decipher what it truly means to live life on the road. Believe it or not, there is currently a high demand for trucking. With new stores and restaurants opening all the time as rural areas are built up and developed, the field of cargo delivery is also growing. For every new Walmart store or Applebee's that opens in a small community, dozens of truckers must make weekly deliveries to keep shelves stocked and kitchens full of food. Despite the demand, however, many aspiring truckers cannot find jobs right away. Working in trucking is competitive and takes dedicated and able men and women to handle the lifestyle. As many recruiters and employers know, not all individuals are suited for a life in transit. To seek a job in trucking, many people start by visiting a trucking headhunter or recruiter. These individuals are trained in matching prospective employees to companies in need based on experience, age, certifications and geographic preferences. When working with a recruiter to find a job in trucking, always be honest. Companies put a lot of trust in their drivers and are looking for dependable, responsible individuals. Be upfront about wage requirements, hours, locations and the previous experience. If there was a lapse in employment history for a period greater than a year, a recruiter or employer may want to know why so be prepared to discuss a resume in detail. 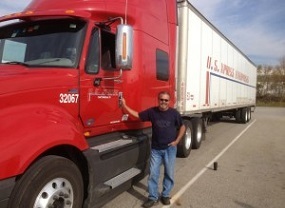 Obtaining a commercial driver's license, better known as a CDL, is the first step in working with a recruiter. No cargo company can hire a driver without a CDL so obtaining this qualification is imperative for all interested individuals. Many recruiters and employers will also need any other licensing information and a driving record to determine eligibility. 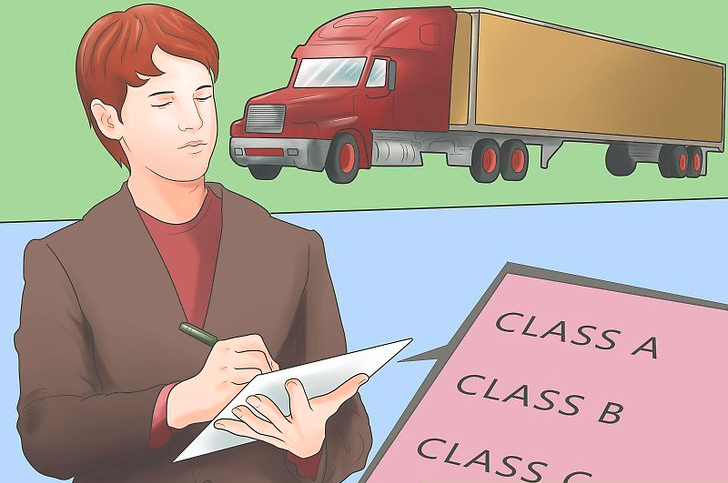 Homeland Security often requires background checks for truckers, especially for positions related to hazardous or sensitive materials so a criminal record must be clean. When running a background check, all employers will require a copy of a prospective employee's DAC, or Drive-A-Check record. A DAC is a comprehensive trucking work history record that details accidents, problems with customers, problems with employers or any illegal or unsanctioned behavior. This record is an employer's first view of a potential new trucker so it is generally of great importance in the industry. If offered an interview, be prepared to discuss work history, job successes and struggles, and qualifications. Most trucking companies are also interested in medical history, to ensure drivers are physically able to sit in a truck seat for hours on end with no threat of health problems. If medical history is worrying, providing a doctor's note stating good health and trucking capabilities is an option. Additionally, companies will almost always require a drug test upon interviewing to make sure employees can safe and responsible with cargo. Most companies also require a road test as part of the interview process as well. These steps might seem tedious and time-consuming but proving worth to a company is paramount to getting a good position and earning great wages. Due to the long hours, truckers are often paid good wages for their hard work. Rather than working as a salaried employee or earning hourly wages, most truck drivers are paid by the mile. New drivers can expect to start out making 25 to 30 cents per mile while more experienced drivers can make as much as 40 cents per mile. Based on an average speed of 60 miles per hour, this is roughly $15.00 to $24.00 per hour, a wage double to over triple the federal minimum. On average, truck drivers make between $800 and $1000 per week, although this amount can be more or less. Despite physical capabilities, laws restrict drivers to the number of hours they can spend on the road. For example, only 11 hours out of 14 hours working can be spent driving. 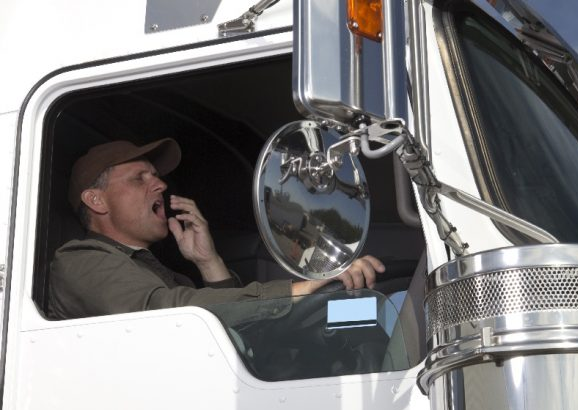 Many companies put GPS or other tracking devices in their trucks to monitor time spent. Truckers are usually reimbursed for gas. Truckers generally travel for several days and get 34 hours off between trips, a time period known as a restart. In theory, drivers can spend this time home with family but this is not common. Due to pick up and drop off locations, most truckers spend their time between trips at rest stops or in hotels. Often, drivers will be granted a restart at an area hundreds of miles away from where they began a trip. It is not unusual for truckers to sleep in their trucks rather than trying to drive home for several hours or paying what can often be a day's wages for a hotel or motel room. Conventional truckers are often home two to four days in an average month. This lifestyle is challenging for parents with families but for the reliable money and opportunity to travel, it can acceptable to many individuals. Truck driving is not a career for everyone due to the long hours spent driving, the monotony of the highway and the possible health risks of eating regularly at rest stops and sitting for long periods of time. For others, the thrill of the drive, the hours spent alone and the satisfactory pay can make a life of pick ups and deliveries well worth it. Truck drivers are highly respected by their employers for the time spent away from home and family and for their integral role in helping companies operate successfully. Despite the challenges, many people find trucking to be a satisfying and rewarding occupation.